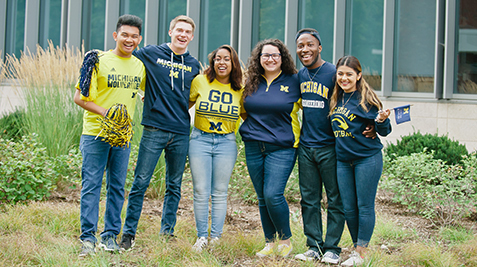 Celebrate the Class of 2019 at Crisler Center on April 28. We hail from every corner of the region, state, nation and world, coming together to shape leaders who address the complex challenges facing southeast Michigan and beyond. We prepare students to be Difference Makers in industry and in the community—long before they graduate. And we’re addressing challenges to the region head-on through pioneering research, strategic partnerships and civic engagement. Get a Michigan degree with a Dearborn drivetrain. Our students, faculty and staff are working together to transform Michigan and change the world. You can be a part of that, while earning the degree that will make a difference in your life and jumpstart your career.